We salute all of you for your bravery! 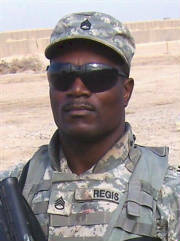 SSG Kyron Regis and SPC "Nike" McClellan were wounded in the same incident that took the life of PFC Branden Cummings on Feb. 14, 2007. They are both doing well and are back with the platoon. SGT Nunn was injured in the same incident that took the life of SSGT Morris when an IED destroyed the humvee they were riding in. PV2 Griffith who was driving but fortunately uninjured, heroically pulled them from the vehicle. 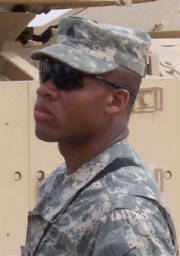 SGT Nunn was in the hospital but has made a full recovery and returned to duty with the platoon. 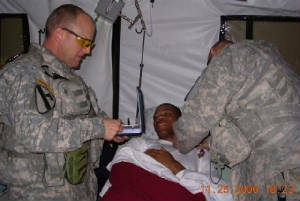 SGT Nunn receives his Purple Heart. Black Antehm Military News-- “You never get over something like this; you have to live with it. 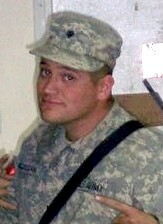 November 25, 2006, will be a day that lives with me for the rest of my life,” said the solemn Pvt. Bradley Griffith about the day he and his crew were hit by an improvised explosive device while traveling on patrol in their humvee. “I think about it everyday, because you can smell something that will trigger a memory,” said the Soldier with Company A, attached to Co. C, 1-12 Combined Arms Battalion, 3rd Brigade Combat Team, 1st Cavalry Division. What started out as a routine day for Griffith, also known as “Griff” to his peers, quickly turned into a rollercoaster of events that would forever shape the young Soldier’s life. Griffith quickly put his “bad feeling” to the side and continued with his mission at hand. And that’s when it happened. After passing a checkpoint, Griffith’s humvee was hit by an IED, sending the humvee into a swerve as Griffith did his best to regain control of his vehicle. “I tried to keep the vehicle on the road as much as possible and it finally came to a stop,” he continued. With no time to think, Griffith quickly exited the vehicle and ran to his battle buddies aid. He first saw Nunn in the gunners hatch, jumped on top of the humvee, and started pulling him out. “I’ve tried to forget [the experience],” said Nunn, a native of Kansas City, Miss. “I remember the blast and smoke and [Griff] dodging and swerving, trying to keep us on the road. My first reaction after the blast was the pain in my right side. I thought I lost my hand. “And in the haze and the buzzing noises around me, all I see is Griff yelling, ‘Get out! Get out!’” Nunn said. Griffith quickly moved around the large vehicle to attend to his comrade but he couldn’t get him out of his door. So, with quick thinking and brute strength, Griffith ran around the other side of the vehicle and pulled the injured DeNeutte out of the smoking humvee. As the medic rendered aid, Griffith manned the machine gun, scanning his sector for the triggerman. Nunn and DeNeutte were quickly evacuated from the area to receive treatment for their wounds. 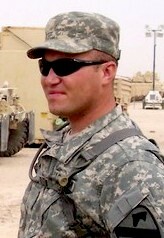 Nunn has since returned to the unit, while DeNeutte is still recovering back in the States. “I suffered a broken hand, shrapnel in the right side of my face, in my right arm and little pieces of shrapnel in my right thigh,” said Nunn. Upon Nunn’s return to the unit after being hospitalized for two weeks, he and Griffith finally crossed paths with each other. And the duo has carried on with their missions since. Griffith has been “hit” by a total of four IEDs now, each taking him back to Nov. 25, 2006, but said he has not been fazed by these experiences. Griffith has stood his ground and handled each situation with care. Griffith also said he has talked with DeNeutte since the attack. Nunn said it was good to be back and didn’t want to go home -- he preferred to stay in the fight and carry out his mission, with Griffith by his side. “He acted on a reflex,” said Nunn, proudly. “It wasn’t, ‘What should I do? Somebody tell me what should I do?’ As soon as [the blast] happened, he handled the vehicle. Once the vehicle stopped, he quickly analyzed the situation, jumped up and got me out of the vehicle. “When the other vehicle pulled up, he quickly got me in-between the two vehicles,” he continued. “He jumped back into the vehicle, got DeNeutte out and he knew there had to be a triggerman on the outside of the road. He jumped in the gunners spot and started looking for that guy. “If you have never been through something like that, it doesn’t matter what anybody teaches you,” said Nunn. “You’re either ready, or your not, and Griff proved his worth that day. It shows a lot about his character and what he’s willing to do for his team. “It’s reassuring…there are guys who know how to handle a situation and know how to respond without being told what to do. Those are the guys you want riding in your vehicle, sitting next to you and going where you go,” Nunn said. Griffith’s and Nunn’s unit knows there is a bond between the two that will never be broken. 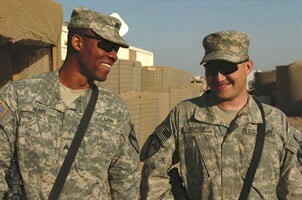 The two Soldiers joke with each other, give the other one a hard time, but deep down, there is love between the two - love for their fellow Soldier and brother.